An independently owned practice based in Ross-on-Wye, our out of hours service is available 24 hours a day, 7 days a week. So we are always here when you need us. 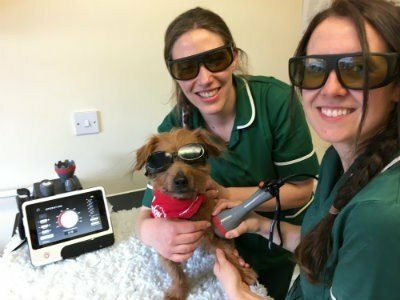 We understand that your pet is a very special member of your family and our aim is to offer a friendly, caring and compassionate professional service for our patients throughout their life. 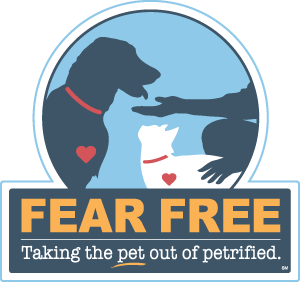 We practice Fear Free Veterinary Visits. What do we mean when we say that a veterinary visit is Fear Free? We are taking lots of measures to make every effort to reduce any fear, anxiety and stress related to our veterinary examinations and procedures. Our equine facilities include stables and paddocks on site as well as the usual visiting service. The practice has been successfully serving the local farming community for decades. We are proud of our working relationship with our farming clients which has been enhanced by our in depth understanding and involvement in preventative health schemes. This is a non invasive, pain free, drug free method of treating painful or inflammatory conditions such as osteoarthritis, back pain, hip and elbow dysplasia. It also treats wounds and infections. Even more exciting, we can now offer Platelet Rich Plasma Therapy and Stem Therapy to treat osteoarthritis using the dog's own body tissues. No drugs or side effects and a single treatment that can last up to a year. Below are just a small selection of services we offer. It is important to us that we provide the best treatment and care of all of our animal patients. We look after all our patients as if they were are own. In order to do this we continually invest in the most up to date equipment and facilities making us proud to be a top class first opinion practice.